I would argue that the most funny, edgy and entertaining writing in the U.S. does not come from The Onion, but from high school newspapers. Granted, the humor coming from the Hormonal Fourth Estate may be largely unintentional, but it can be hilarious nonetheless. As editor of the "Reviews" section of my high school newspaper I was notoriously bad at my job. I rarely attended class and edited my stories with the same attention to detail Don Draper gives his wife. My lack of diligence even got the "f-bomb" inadvertently published in my high school paper. It is with this same high standard that I present a piece by Kevin Jensen. His story appeared in the November 26, 1982 edition of his high school newspaper, the Oelwein Husky Register. Titled, "Computers, Get Used to Them!" the article says that computers are on their way but we have nothing to fear (as long as we have sledgehammers). The opening line starts by insulting the reader and just keeps getting better. The entire piece appears below. Unless you're totally ignorant, you have probably noticed that computers are the talk of the early 1980's. If you're a typical American, you are probably also growing tired of hearing how these computers will be running your life in the near future. You may even have a slight fear of computers. No, I don't mean you wake up in the middle of the night in a cold sweat screaming, "Don't hurt me, computers!" But I think we all have a slight fear or uneasy feeling over things we are unfamiliar with. Contrary to what you may have heard, your hands will not fall of when you touch the keyboard of a computer. I was a little apprehensive when I walked into a computer programming class for the first time this year. All I knew about computers, prior to class, was they had computed my class schedule the last two years. As I began to become more familiar with computer language and how to write computer programs, my uneasiness went away and I found working with computers enjoyable. If you are considering taking a computer class (whether you are an adult or a student), I think you'd enjoy it. You may struggle a little at first learning the language and proper usage of statements, but with some persistence on your part, your mind will start picking up the techniques naturally. 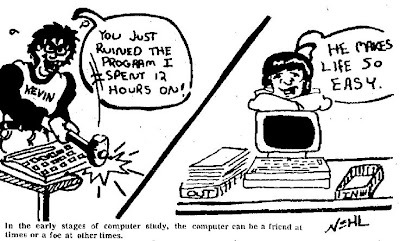 You will probably also discover in your early stages of computer study that the computer can be a friend at times or a foe at other times, because of your inexperience. For example, in computer programming class, when a program you have sweated over and worked on ruthlessly for a considerable length of time is run on the computer screen just as you planned, you might give the computer a nice pat on the top and then proceed to print out "your pride and joy." On the other hand, when a different program assignment does not run on the computer screen as planned and the screen is showing you what seems like an infinite number of incorrect statements in your program you wish like heck you had a "nice" sledgehammer to make the computer see things your way. Whether you like or dislike computers or are or aren't interested in them, you had better get used to hearing about them in the media. The experts predict that computers are going to be with us a long time and will be as commonplace in the home as the telephone by the year 2000.